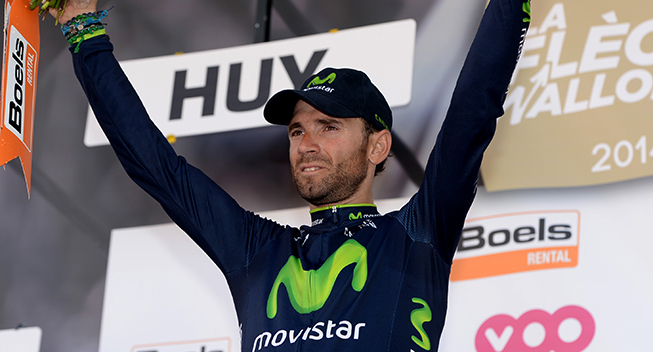 Movistar has announced the roster that will help Alejandro Valverde reach his life-long dream of finishing on the podium in Paris. The captain will be backed by a strong group of climbers consisting of John Gadret, Benat Intxausti, Ruben Plaza, Ion Izagirre, Jesus Herrada and Giovanni Visconti who has taken the final spot instead of Alex Dowsett, while Imanol Erviti and Jose Joaquin Rojas will be on hand in the flat stages. With 22 victories on their season tally and three national titles - Valverde and Malori were crowned ITT champions in Spain and Italy, while Ion Izagirre got the 'rojigualda' jersey in Ponferrada - as a final moral boost, the Movistar Team will head into the 101st edition of the Tour de France. The Grande Boucle, which will start in Leeds on Saturday, will see Eusebio Unzué's squad bringing a strong nine-man block aiming to repeat last year's podium finish claimed by Nairo Quintana. With Alejandro Valverde as designated leader for the overall classification, the Blue roster for the French stage race will be completed by Imanol Erviti, John Gadret, Jesús Herrada, Beñat Intxausti, Ion Izagirre, Rubén Plaza, José Joaquín Rojas and Giovanni Visconti. Unzué's structure will take part in the Tour for a 32nd consecutive time, having snatched 7 overall victories (five from Miguel Indurain, one each by Pedro Delgado and Óscar Pereiro), 31 stage wins and spent 80 days in the yellow leader's jersey. "The goal is fighting for a podium place in Paris with Alejandro, that's clear," manager Eusebio Unzue said. "He's coming into the race really strong, confident about his chances of achieving that objective, on a route I think suits him pretty well. "We know there will be lots of traps he'll have to get over - the stress in this race makes all risks a lot bigger. Still, we hope to get through the first week in good shape and start the first weekend of mountains in the best possible condition. "He will have a balanced team by his side, with riders suited to all terrains and in perfect form. Intxausti and Plaza had gone through some problems in the last few weeks, but looked totally recovered in the National Champs. Izagirre has already shown his condition; Erviti and Rojas are a guarantee, as well as Gadret, who will be important in the mountains. "Jesús Herrada will make his debut because we think he's prepared to debut in a Grand Tour, and by his characteristics, I think this is the one that can be most adequate to him. He took a huge leap forward this year and he deserved it. "It's so sad for us to leave Dowsett out of the team - despite his efforts, he couldn't get to his best form due to breathing problems resulting from an infection he suffered; on the other hand, Visconti contested the win until the very in the Italian championships on Saturday, which indicates he's in good condition."